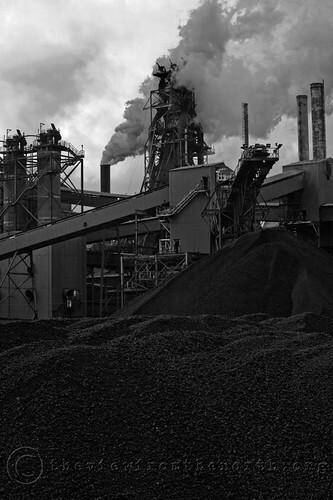 For better or for worse, Britain in 2009 is very much a post industrial society. The physical and economic landscape of the north (and other regions) has been transformed with the well documented decline of the traditional industries, and the rise of the service sector. The skylines of our towns are different to 20, 30 40 years ago. The giant enterprises on which entire towns and villages were reliant on for their employment and prosperity have gone. Or so I thought. 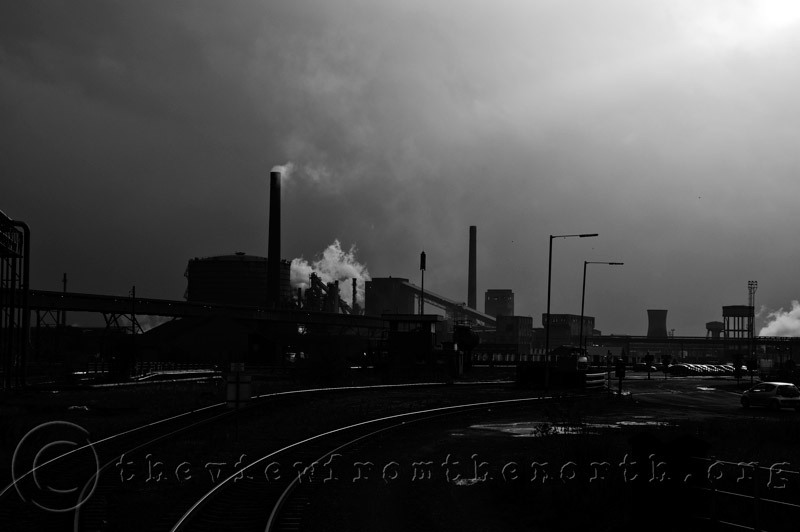 I first encountered the steelworks at Scunthorpe after taking a wrong turn on my way home from Lincolnshire . 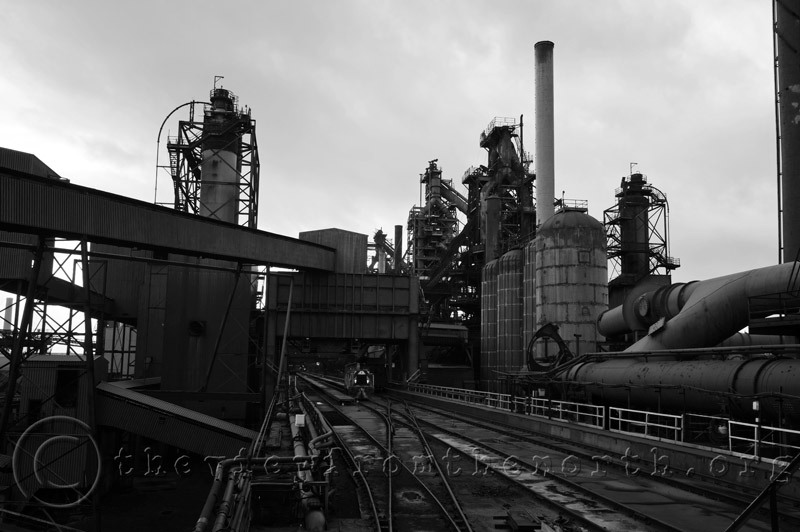 I was aware that there was a steelworks there but had never given it any thought. But there, looming in front of me was this vast complex of huge buildings, chimneys and cooling towers. I was intrigued. A quick look on Google Earth when I get home confirmed the vast scale of things – a huge black and grey area that was the east side of the town. But like many things, it’s shrunk from what it was, as two other works in Scunthorpe were closed in the 80’s. But although the inevitable retail parks and distribution warehouses have sprung up, this is still a one horse town. Thanks to the Appleby and Frodingham Railway Preservation Society, it is possible to indulge in a spot of industrial tourism and see the place close up form the relative comfort of a steam hauled brake van. This is an excellent opportunity to see something of the enormity of the operations – 2000 acres, traversed by 70 miles of railway line and 15 miles of road. It’s like a vast trains set juxtaposed onto a strange man-made landscape. Actually rail is the best way of seeing the site, as the roads don’t go everywhere the railway does, primarily because a lot of the material on site is moved around by conveyor or rail. Our little train was hauled by a delightful little 0-4-0 Peckett steam locomotive whose remarkably short wheelbase was ideal for the tight turns around the site. Initially we steamed alone the lines between the sheds, and even backed into the track making mill, recently transferred from the now closed Workington site in Cumbria . But then we took a ride up a winding ramp to the ‘high level’ which was a great length of track that serviced the four blast furnaces. I’ll admit to not really understanding what went on as our guide sensibly sat in the warmth of the brake van while I stood outside on the cold of the veranda. Watching the site go by made me feel like I was on the set of some strange science fiction movie, sat in the distant future on a huge mechanised planet – all grey metal, huge pipes going off onto the horizon, steam, smoke, miles of cable and no people. Suddenly a strange-looking loco came shuttling down the high level, looking like a railway wagon cross-bred with a stealth fighter. As it’s great grimy mass slowed to a halt under an enormous hopper, the orange clad driver inside it became visible through it’s blackened windows. Finally, life! I was reminded of Fritz Langs ‘Metropolis’, a nightmarish vision of the future filmed in the 1920’s were huge numbers of people went underground to work the huge machines that supported the modern society above. Sure, it was a Saturday, and we didn’t go into any of the production sheds, but caveats aside, this huge unmanned mechanical landscape seemed so out-of-place in our eco-friendly world of risk assessments, play stations, space travel, consumerism and Starbucks. As we travelled round the site, it quickly became apparent that things were picking up at the plant. Despite mixed messages on the economy from the politicians and financiers, production was on the increase. An unusual gauge of this was the number of ‘torpedo’ wagons standing idle in sidings. 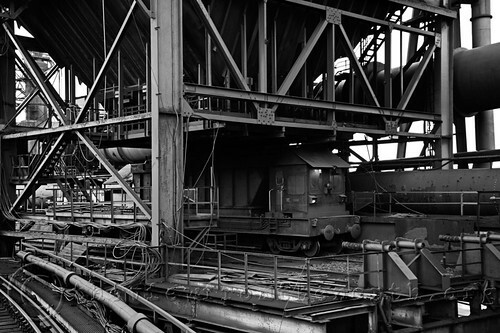 These huge devices are used to ferry molten iron from the furnace around the site to where it is needed, and only three were laid up. This was regarded as an improvement and a sign things were getting better. As a lot of output from the plant is for the construction industry, they have really felt the brunt of the financial crisis. We continued around the site chugging along side the slag heaps (worked by huge trucks rather than rail, alas), and between the enormous plate mills. These vast mills formed an enormous metallic canyon, and our shrill whistle echoed down it’s walls accompanied by the thump of the machinery hidden within. We passed briefly inside as the line took us through a huge warehouse, and got a tantalising glimpse of the cavernous interior, but emerged all too quickly back into the Lincolnshire drizzle. As we made our way back round to our starting point, the steam and the noise from our little engine almost came symbolic as a bridge between our industrial past and the present. And yet the huge site it was transporting us round has its origins in the same Victorian times as the steam age technology that was propelling us. Which got me thinking, 150 years from now, will people be as fascinated by the retail parks and warehouses of our times? I think not.